In the era of the antihero, few were more antiheroic than Clyde Barrow and Bonnie Parker. 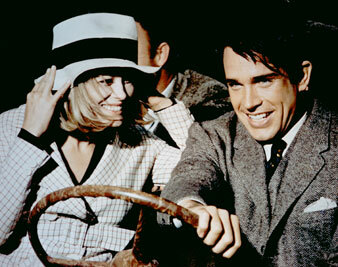 Everett Collection Faye Dunaway and Warren Beatty in Bonnie and Clyde, 1967. Stars: Warren Beatty, Faye Dunaway, Gene Hackman, Estelle Parsons, Michael J. Pollard, Gene Wilder. In the era of the antihero, few were more antiheroic than Clyde Barrow and Bonnie Parker, who while sitting in their car, went out in a blaze of glory–187 shells–courtesy of the most near-sighted troopers in history. I have been out of town for some time and must try to catch up. Arthur Penn’s Bonnie and Clyde is a mesmeric, shocking, often delightful and far from perfect film, and I think I know why it has generated an almost excessive amount of controversy. The complaint that it is not an accurate account of the Dust Bowl 1930s is beside the point, since it is not, nor intended to be, an accurate account of any decade. Its pale, nostalgic Technicolor and insistence on stilted group snapshots; on occasion, the marionette attitudes of its performers and syncopated pace of its action, make clear that it is dealing with legend, not life. The movie’s relevance, moreover, is less to its own era than to ours. The funloving Barrow gang, laughing and larking its murderous way through the depression-stunned small towns of the Southwest, rootless, aimless, squalid and lethal, was not, it now seems, a poisonous symbol of temporary crisis but an early symptom of a deformed and inadequate society. As Penn tells it, Bonnie and Clyde robbed banks because they had no idea who they were. The money they got was never more than enough to keep them in hamburgers until they could pull a next job, but it was not fear of hunger that drove them, it was fear of anonymity. “We rob banks,” they announced to strangers on the road, and smirked as they said it; they squandered the cash but treasured the press clippings. They did not kill from viciousness but from incompetence, and Clyde was unable to make love to Bonnie in their infantile world of romance on the run. All this should strike the viewer with icy familiarity in our day of motorcycle gangs and flower children, Nazi insignia, cheap beads, incense, drugs, apathy and motiveless violence. I have some doubt that Bonnie and Clyde were quite the hallucinated children that Penn makes them, but in retrospective fiction they legitimately become so. The fault of the picture is that emotionally it is somewhat untrustworthy. The cast, led by Warren Beatty and Faye Dunaway, is eloquent, intelligent and marvelously plastic. Indeed, in Penn’s hands it becomes too plastic, for the director seems uncertain as to his attitude toward his material, and his players dexterously act it in a variety of styles. At times one seems to be entirely on the outside, witnessing a clinical demonstration; then the filter shifts and we are enveloped in sudsy sentiment. Passages are offered in an estranging, mocking slapstick, only to merge into old-fashioned chase melodrama and then into the pain of real emotion and real laceration from real bullets. The effect is morally queasy; it leads to charges of exploitation, sensationalism and irresponsibility. This was perhaps bound to happen, but it may be unfair. I think Penn wanted to make a picture that, through poetic remove from the extravagance of its incidents, would both gratify as entertainment and instruct as fable. It is not easy to drive that tandem vehicle, but Bonnie and Clyde comes near enough success to make its intention clear.